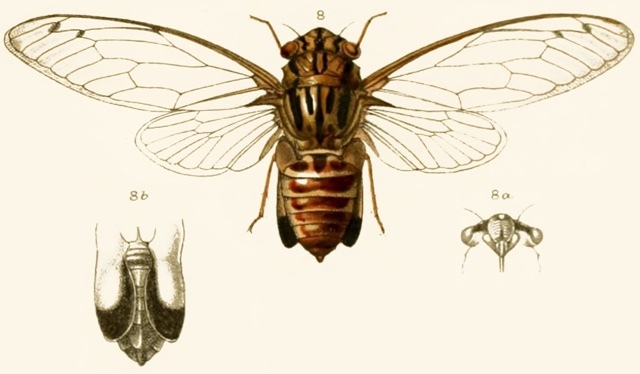 Orientopsaltria duarum (Walker, 1857) is a cicada found in the Malayan Archipelago. Orientopsaltria duarum was formerly known as Cosmopsaltria lauta. Head and thorax above ochraceous, with the following black markings: — Head with a central fascia to front, vertex with a central double fascia and a sinuated fascia behind each eye; pronotum with a central double fascia united at base, a large sublateral spot on each side, and a spot beneath on basal margin; mesonotum with a central longitudinal fascia, on each side of which is a short and somewhat oblique fascia, followed by a small spot on anterior margin and a broad, sublateral, irregular fascia, and a spot in front of each anterior angle of the basal cruciform elevation. Abdomen purplish red, the posterior segmental margins ochraceous, excepting those near apes, which are piceous, and with a central discal piceous spot near base. Head beneath with the anterior margin black and a central piceous spot near apex of face. Opercula ochraceous, with apices and inner margins broadly black; apex of abdomen beneath black. Tegmina and wings pale hyaline, the venation more or less fuscous ; tegmina with the costal membrane castaneous, the transverse veins at the bases of the second and third apical areas infuscated. The face is convex, with a central longitudinal incision, which neither reaches base nor apex. The opercula are long and broad, concavely sinuated on their outer margins near base, and with their apices obtusely rounded and about reaching the apical abdominal segment. Rostrum mutilated.